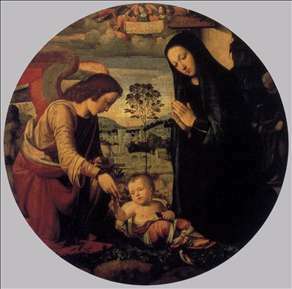 Florentine painter, trained by Cosimo Rosselli, in whose studio he met Fra Bartolomeo. The two went into partnership in 1508, but soon after this Albertinelli temporarily abandoned painting to become an innkeeper, saying (according to Vasari) that he was fed up with criticism and wanted a less difficult and more cheerful craft . Vasari also says he was a restless man, a follower of Venus, and a good liver. His paintings are elegant but rather insipid. 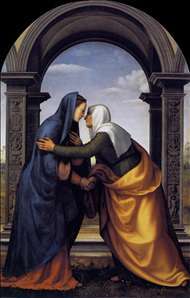 His best work is the Visitation (1503) in the Uffizi Gallery, Florence. See more details about "Adoration of the Child with Angel"
See more details about "Visitation"
See more details about "Birth of Christ"
See more details about "Circumcision"